Approximately 93% of the connected televisions for sale support HbbTV and HbbTV services are being deployed by broadcasters throughout Europe, according to the EBU. Audience research shows that users appreciate HbbTV, not just to access on-demand video, but also to find out more about a specific programme or even to browse through the extended EPG-like data. In Spain RTVE now reaches more than 700.000 homes with their 90.000 hours of HbbTV offerings, which were soft-launched only eight months ago. 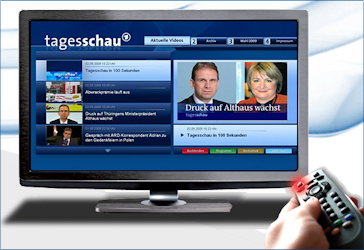 In Germany, in which HbbTV services have been available already since 2009, the ZDF HbbTV platform now generates over 2.5 million views per day. Ten million HbbTV enabled televisions have already been sold in that country. The Dutch HbbTV Forum recently published a free report with an overview of HbbTV services in Europe. It is available for download here. The success of HbbTV shows that the EBU needs to continue to invest in standardisation efforts that allow broadcasters to run their own cost efficient services and stay in direct contact with their audience in the future. Currently the EBU is focusing on HbbTV v2, which is being developed in close cooperation with the industry. It will enable the use of new popular browser technology (HTML5), an improved streaming format (DASH) and pairing with second screens. These extensions will guarantee the growing popularity of the standard in the future. HbbTV 2.0 is expected to be finalised later this year, and to appear in products soon after.